Heather Roy is the epitome of the axiom “don’t judge a book by its cover.” Heather is a “pint size” provider that out-performs her larger size peers. Heather was hired in September 2006 within our Special Transportation Division transporting students with special needs. In March 2007, she transferred to the EMS Division as an EMT. Heather excelled in this position and has great respect for her peers, partners, hospital staff, and fellow first responders. Heather is truly a patient advocate. She surfaces issues for patients that may not be of a medical nature, but are impacting their quality of life, so that they can be addressed. Always willing to improve herself through reflection after each call she completes, she was the perfect candidate for a Field Training Officer position. Heather has great interactions with the new employees she is assigned. In particular, because of her solid technique, Heather has become the company’s ”lifting guru” for any new employee needing additional lifting assistance in this area. Heather has also recently accepted and trained to become one of Hunter’s first Certified Car Seat Technicians. She provides proper installation and instruction of car seats for those in need in our community. 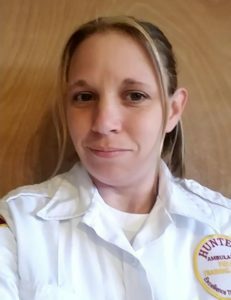 Heather is a positive role model for our EMS staff and a great advocate for our organization.